With just three main ingredients, you really need to pay attention to the quality. Choose sweet, plump tomatoes for this. In the summer that’s pretty easy, but if your outside the summer months, you might need to look a little harder. We really like to stick to smaller, vine-ripened tomatoes or if you can find them Kumato tomatoes, which we’ve found to be sweet all year round. 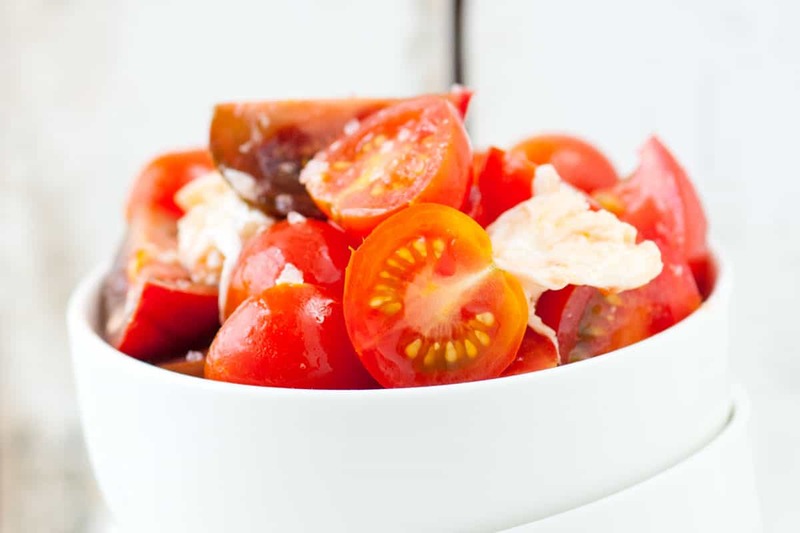 Combine tomatoes with a generous pinch of salt, small pinch of pepper and the olive oil. Stir then let sit for 10 minutes. Stir tomatoes once more, and then add cheese and basil. Season to taste with more salt and/or pepper then enjoy. Use ripe tomatoes for this. When choosing tomatoes, look for those that are heavy for their size and give ever so slightly when gently squeezed. When storing tomatoes, always store at room temperature. For an extra punch of flavor, add 1 to 2 tablespoons of high quality balsamic vinegar at the same time as you add the olive oil.